Anna Hazare is one of India's well-acclaimed social activists. A former soldier in the Indian army, Anna is well known and respected for upgrading the ecology and economy of the village of Ralegan Siddhi which is located in the drought prone Ahmednagar district of Maharashtra state. For Anna Hazare, it is another battle. And he has fought quite a few. Including some as a soldier for 15 years in Indian Army. He enlisted after the 1962 Indo-China war when the government exhorted young men to join the Army. In 1995-96, he forced the Sena-BJP government in Maharashtra to drop two corrupt Cabinet Ministers. In 2003, he forced the Congress-Nationalist Congress Party (NCP) state government to set up an investigation against four ministers. But Anna Hazare has soldiered on relentless. From one battle to another in his war against corruption. He fought from the front to have Right to Information (RTI) implemented. He is now fighting for the implementation of the Jan Lokpal Bill, an anti-corruption bill drafted by leading members of civil society that envisages speedy action in corruption cases against everyone, including ministers and senior bureaucrats. After leading a number of nonvoilent protests in Maharashtra state against corruption, Hazare started a fast unto death on 5 April 2011 to exert pressure on the government of India to enact a strong anti-corruption act as envisaged in the Jan Lokpal Bill, a law to establish a Lokapal with the power to deal with corruption in public offices. The fast led to nationwide protests in support of Hazare. The fast ended on 9 April 2011, the day after all of Hazare's demands were agreed by the government of India. The government issued a gazette notification on the formation of a joint committee (of government and civil society representatives) to draft an effective Lokpal Bill. He addressed the people and set a deadline of 15 August 2011 to pass the Lokpal Bill in the Indian Parliament. On 6 June 2011, the members of the civil society of the joint Lokpal bill drafting committee in New Delhi sent a letter to Pranab Mukherjee, the chairman of the committee, explaining reasons for their absence at the meeting and also asked government to make its stand public on the contentious issues related to the proposed draft legislation. They also decided that the future meetings will be attended only if they were telecast live. 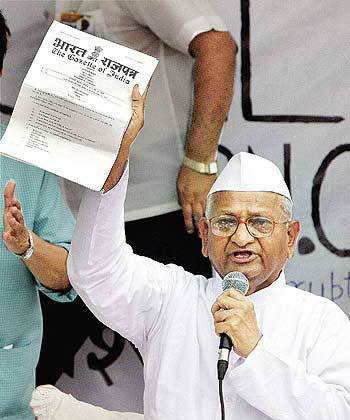 On 8 June 2011 at Rajghat, describing his movement as the second freedom struggle, Anna criticized the Government for trying to discredit the joint Lokpal Bill drafting committee and threatened to go on indefinite fast again from 16 August 2011 if the Lokpal Bill is not passed by then. He also criticised the Government for putting hurdles in the drafting of a strong Lokpal Bill and its attempts to malign the civil society members of the joint Lokpal panel.